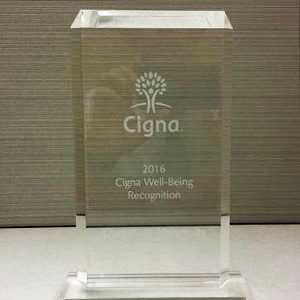 The Duquesne University Center for Pharmacy Care, in cooperation with the Human Resources and Benefits departments, earned 2016 Cigna Well-Being Recognition from the health insurance company. The Know Your Numbers healthy lifestyle monitoring program and Medication Therapy Management services offered through the Center for Pharmacy Care among other programs offered to Duquesne University employees earned the recognition from Cigna. The Center for Pharmacy Services, recently relocated to the third floor of the Duquesne Union on campus and the Duquesne University Pharmacy in the nearby Triangle Shops Complex, provides wellness, disease prevention and medication therapy management programs, focusing on hypertension, dyslipidemia, diabetes asthma, chronic pain, depression, travel health and osteoporosis in addition to offering campus and community health screenings, lifestyle counseling, educational seminars, drug therapy review and management, disease state management and outcome reporting for certain health conditions.